I am a writer who likes to ask questions. He said he liked to do things that some thought couldn’t’ be done and he liked to break the rules. 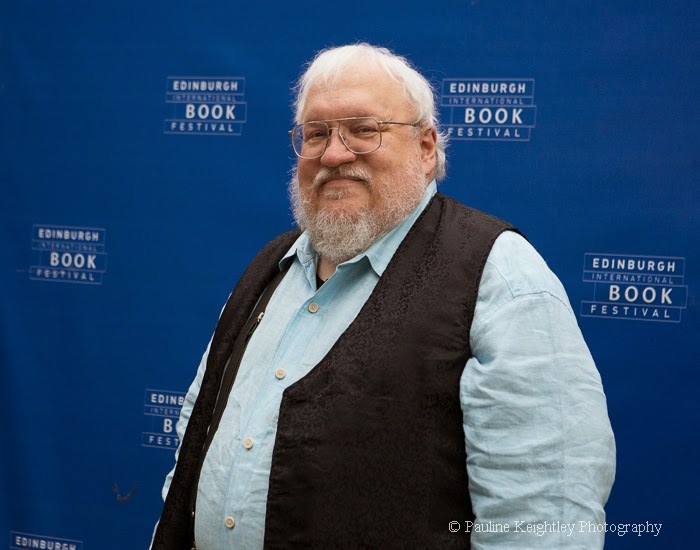 RR Martin brought his spirit of fantasy with him to Edinburgh yesterday. He was spirited in the side gate by his lady helpers to Edinburgh International, Book Festival 2014,and smiled for his photo shoot on the festival walkway. He has silver white hair and beard and could be one of the characters in his writing. .
A younger than usual crowd packed into his talk, when he spoke of how Scotland and Scottish history had informed his epic Game of Thrones, now a massively successful HBO tv series. He spoke with Booker prize judge and literary critic Stuart Kelly, of a visit in ‘81 to Hadrian’s wall, on a cold grey October in the late evening, when he thought of all the Roman legionaries posted there and how it might have seemed the end of the world to them. This later became his Wall of Ice, He also spoke of famous Scottish women who were often Queen Regents to 3 year old kings – such as Lady MacBeth, Mary Queen of Scots. Other Scottish stories have also inspired his writing - the Glencoe Massacre, (the Red wedding) and the writer Walter Scott. He was particularly interested in medieval history and its blood thirsty side. Martin started out writing science fiction, with a horror twist – such as the Sand Kings. He thought since Tolkien that most were writing in a Disneyland style of fantasy. He liked to explore the grittiness of history. One of his main motivations Martin said, was strong characters who wrestle with the issues. He asked what are their motivations, what is their culture? Writing about a villain can be fun and looking at their dimensions and motivations. His books are infused with moral realism and he said that he enjoyed writing about broken things – outcasts, bastards as there is more drama and that conflict is the heart of drama. He was asked about the locations in his books. He spoke of growing up in New Jersey, between 1st street and 5th street and of how he escaped in fantasy to Gotham, Middle Earth and with HG Wells. He said , I lived a thousand lives in the pages of books.